If you’re in charge of event planning for your company or organization, it can be a very challenging task. You’ll have to keep on top of all the details, large and small. There are guest lists to put together and invites to send out. You need to plan food and entertainment. But anyone who’s ever planned an event knows that the biggest consideration is often the bottom line. You don’t want to let costs get out of control. At NY Party Works, we’ve helped our customers plan all types of events over our more than 30 years in business. We also know that sometimes events have a smaller budget. That doesn’t mean the event won’t be a big success. So we want to share some tips we have for event planning on a smaller budget. 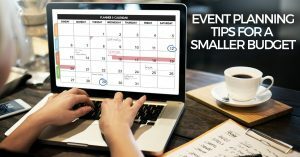 The first and most important tip for keeping an event under budget, particularly with a limited budget, is to stay organized. There are several ways some advanced planning can help you save some money, according to the Houston Chronicle. You should determine what type of event you want to have and then where to have it. Then you can negotiate with potential venues for the event. One way to keep costs down with your venue is to ask for lower rates in return for advertising the site at the event. Once you have the location in place, the Chronicle recommends that you hire a professional planner because they are trained to handle a wide variety of budgets and they are experienced with dealing with vendors who can help save you money on products and services that you might need for the event. That’s why you should consider Total Event Planning with NY Party Works. We will work with you to find out what your goals are for your party or event. And of course, we’ll take your budget into account. NY Party Works can put you together with decorators, caterers, entertainers like DJ’s, MC’s and dancers. We can also make sure to give your event the ambiance you’re looking for. We can help provide lighting and special effects and lounge furniture. Another way to keep cost down for your event is to use sponsors, according to Eventbrite. Companies are often looking for ways to get their names out there without having to pay high advertising fees. So put out feelers and try to find a sponsor that is closely related to your business. If you’re looking for a speaker for your event, try to hire somebody who’s already in your area to cut down on transportation fees. When putting the menu together, think of ways to reduce catering costs. Consider a buffet, rather than sit-down food. You might want to just have hors-d’oeuvres, and a cocktail party rather than a full meal. NY Party Works, can work with you to come up with a proper catering menu that fits within your budget. If you’re looking for something that will make your event really stand out, we also have food concession rentals. We can provide you with a coffee truck, a hot dog cart, a popcorn machine and more. Whatever your event is and whatever budget you have, odds are that NY Party Works can help you achieve your vision. We can take the stress out of event planning and help you make your event a success. Contact NY Party Works today.